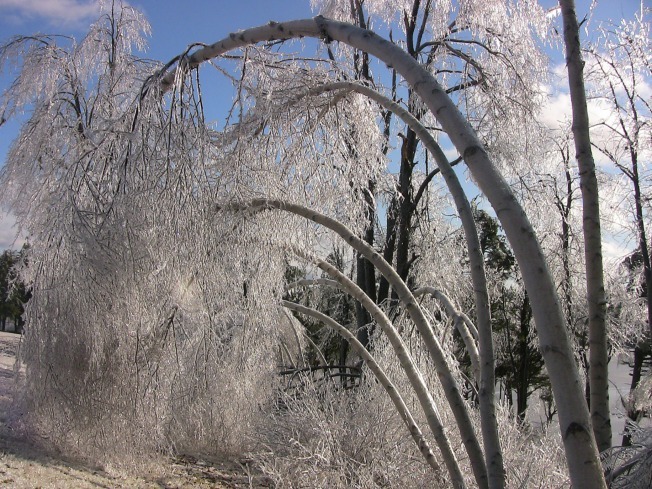 This scene shows frozen trees on the campus of Franklin Pierce University in Rindge, NH, over the weekend. Cold weather continued to keep ice on trees in the region after a devastating ice storm destroyed utility poles, wires and other equipment, making some roads impassable. JAFFREY, N.H. — Joined by people seeking shelter from the bitter cold, parishioners at the Jaffrey Bible Church on Sunday thanked God for a warm place to sleep and for the utility crews struggling to repair power lines snapped by New England's devastating ice storm. "Your fellow Jaffrey residents have stepped up and made this a more bearable situation," Walt Pryor, recreation department director for the town of 5,700, told the congregation Sunday morning. Church administrator Rick Needham noted the "terrible devastation in our lives and homes," recognizing two families whose homes were damaged by falling trees. About 150 people attended Sunday's service in Jaffrey, about 15 miles from the Massachusetts state line. The church had been turned into a shelter, with cots and mattresses set up in offices and hallways, and televisions and 1,000-piece jigsaw puzzles for children in the basement. Donated food was plentiful, including lobster casserole, pot roast, and barbecued chicken. The ice storm knocked out electrical service to 1.4 million homes and businesses late last week. More than 570,000 customers still lacked power Sunday afternoon in upstate New York, Massachusetts, New Hampshire, Vermont and Maine. Utilities in hardest-hit New Hampshire said power might not be totally restored to the region until Thursday or Friday. Officials warned power failures could rise again as drooping branches shed ice and snap back to their original positions, potentially taking out more power lines. President Bush declared a state of emergency for New Hampshire and nine of Massachusetts' 14 counties, directing the Federal Emergency Management Agency to provide relief assistance. Adding to the misery of downed power lines and property damage, temperatures dropped into the teens and 20s early Sunday, with single-digit readings in parts of New Hampshire and Maine. Fryeburg, Maine, hit a low of just 2 degrees above zero. Warmer weather was on the way for Monday. The number of people at shelters in Massachusetts nearly doubled to 1,800 Saturday night as people faced another night without lights and heat. Nearly 1,300 people stayed at 56 shelters in New Hampshire. In Jaffrey, Nancy Caisse tried to comfort her young daughter, who was sick with a stomach virus and fever, while helping elderly shelter guests with their medication. She was trained as an emergency medical technician and said she was glad to be of use. "This is a blessing," said Caisse, 40. "I'd rather be here helping out." New Hampshire, Massachusetts, New York and Maine declared either limited or full states of emergency Friday. Crews across the region reported the ice had destroyed utility poles, wires and other equipment, but said the extent of damage was unclear because some roads still were impassable. About 300 national guardsmen were deployed in New Hampshire, mostly in Stoddard, 27 miles north of Jaffrey, to help with debris cleanup. Despite the difficulties, utilities were making progress with help from utility crews from Canada and as far away as Virginia and Michigan. "Slowly but surely we're creeping in the right direction," said Peter Judge of the Massachusetts Emergency Management Agency. In Vermont, Green Mountain Power President Mary Powell toured affected areas, helping distribute lunches to the line crews, and said the damage rivaled or even exceeded what happened during the 1998 ice storm that hit northern Vermont. "Whenever you get this kind of ice accumulation, there's just nothing from a utility perspective you can do to protect your customers from devastating damage," Powell said. Emergency management officials reported four storm-related deaths. One man in New Hampshire and a couple in New York state died of carbon monoxide poisoning from home generators. The body of a Massachusetts public works supervisor who went missing while checking on storm damage was recovered from a reservoir.